Today we printed elgolem's Chmutov-Schwarz minimal surface model on Thingiverse, in honor of George Hart's wonderful bouncy circle sculpture from G4G11. Settings: To print this object we had to convert from obj to stl (used MeshLab); it was huge so we then reduced the scale twice by 50%. 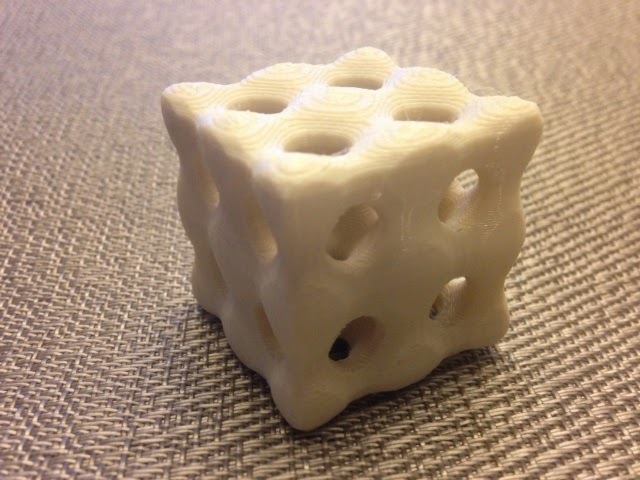 Printed on a MakerBot Replicator 2 with .3mm/low layer height, with raft but no support. The raft was needed; without it the circles on the bottom layer wouldn't adhere to the platform (blue tape on glass). Stuff to change next time: The bottom of the model is very rough and either needs finer resolution or support for future prints. The rest of the model did very well without supports.